On the Cover: Skywatchers will be poised to observe the heavenly string of pearls known as comet Shoemaker-Levy 9 this July when it crashes into Jupiter's swirling atmosphere. 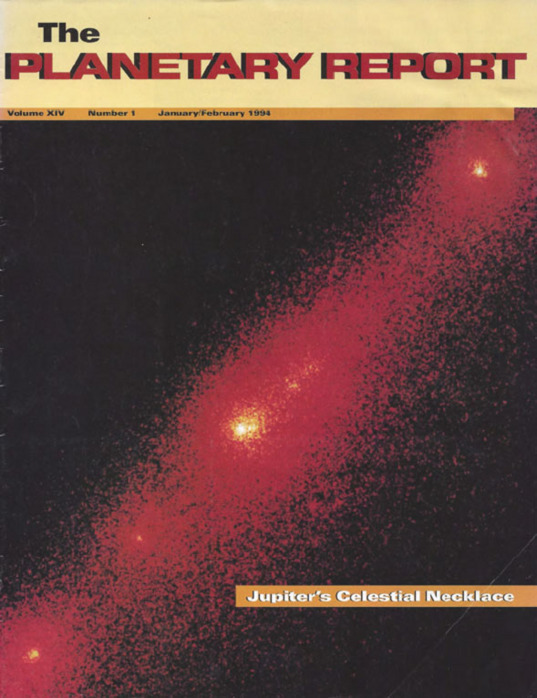 This is an enlargement of an image captured by the Hubble Space Telescope (HST) on July 1, 1993, showing the region of the brightest nucleus of the comet, torn apart when it came too close to Jupiter in 1992. This "bright nucleus" is actually a group of at least four separate pieces. The span of this entire image covers about 64,000 kilometers (40,000 miles). North is at the lower right. 4 Bodies at the Brink: Paul Weissman discusses how new equipment has allowed astronomers to prove that Gerard P. Kuiper's theory—of a band of comets at the edge of our solar system—was right. 8 Jupiter Watch: The Celestial Necklace Breaks: Charlene Anderson presents The Planetary Society's plans to bring this "once-in-a-thousand-lifetimes" event to as many people as possible around the world. 10 A Rover's Journey: Linking Two Worlds: George Powell brings us another chapter in the development of a mobile robot designed to explore Mars. 3 Members' Dialogue Sending names to Mars, the loss of Mars Observer, and the coming millennium. 16 Readers' Service Looking at chaos' applications to understanding our solar system. 17 World Watch A time of birth and death for NASA. 18 News & Reviews The Magellan mission from a planetary scientist's perspective. 19 Society News Opportunities to get involved with Society activities. 20 Q&A Is there an ozone layer on Mars?